Wow... so fast its day six already. The 1st two days okay lor.. stay home and visited some relatives. Then 3,4,5th day visiting non-stop. No one visited me tho. 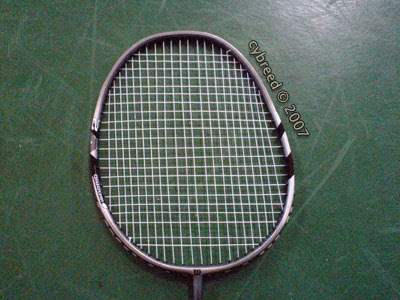 On the 3rd day my friend brought me my brand new badminton racket from Singapore(RM 100.00) So yesterday, finally I string it, and bought a new grip (RM 28.00) and we went off to play it at 3pm - 6pm. Within two match, it was out of shape! So as you can see, its out of shape! ARGH! Oh well, getting ready to hit the beach today. Yay~ hopefully things go smoothly.